​Julianne Allcorn is a practising artist and art teacher based in Roseville near Sydney, Australia. Julianne Allcorn’s current body of work is inspired by the Australian bush. The flora and fauna that surrounds the hideaway in the Burralong Valley, Lower Hunter and around her garden studio is where she spends time sketching, planning and playing in her journals. ​Drawing from real life, she makes very detailed, fine and focused studies of the insects, birds, flora and fauna, hidden and placed within the artwork to bring alive the conversations of the bush. 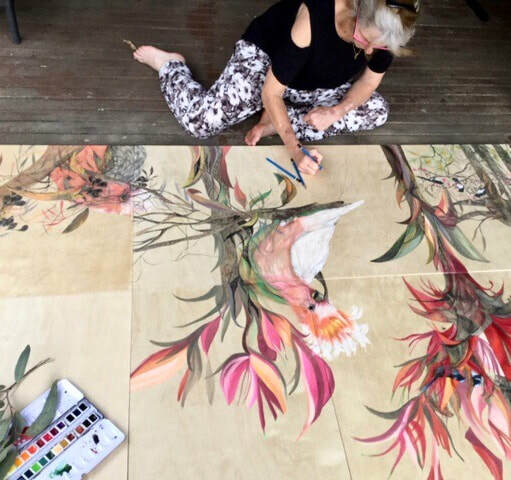 Julianne Allcorn works on birch wood panels etching into them with pencil and a small dremmel bringing the textures of the flora and fauna into her work; working in pencil and painting in water colours allows her to bring the soft hues of the bush alive into her artwork. The viewers are encouraged to stop and stand quietly, close the eyes and allow all the 5 senses then to listen, smell, to want to touch and imagine the taste of the aroma found in her native bushland.